A two-storey cottage on the northcoast of Hiiumaa island for max. 8 people. On the lower floor there is a living room with open kitchen, sauna, shower. Open terrace. Sleeping quarters are located upstairs. Balcony. Altogether there are 4+4 beds. TV. Radio, stereo, video. Fireplace. Dishwasher. Sauna. Possibility of barbequing. Distance to the beach (in public use) is 250 meters. 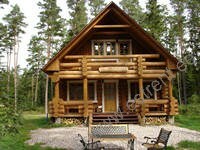 The cabin is surrounded by a beautiful pine forest. Hiiumaa is especially suitable for cycling - extensive road network, relatively light traffic, plenty of sights, nature trails, various cultural events in different parts of the island. Ferry connection to both the continent and the island of Saaremaa.